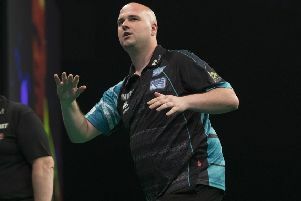 New darts superstar Rob Cross will make his first tournament appearance as world champion tonight (Friday). The St Leonards-based player will line up in the 2018 Unibet Masters at Arena MK in Milton Keynes, live on ITV4. Cross has enjoyed an incredible rise since joining the professional circuit a year ago, capping his emergence by picking up the World Championship title on New Year’s Day. Now the world number three, Cross is one of four Masters debutants this weekend as he takes on 14th-ranked Ian White over the best of 19 legs in round one tonight. “It’s really exciting,” said Cross, the 4/1 second favourite for the tournament with sponsors Unibet. “The past year has been full of new experiences for me and this will be another one. “It was a goal of mine to get into the Masters anyway because it’s the top 16 in the world and it means a lot to be in that bracket, but to be here as world champion is amazing for me. With a £60,000 top prize at stake for the winner, the Masters will see the world’s top 16 ranked players battle it out over the next three days. If Cross can repeat his victory over White in last summer’s BetVictor World Matchplay - and he’s 2/15 with Unibet to do so - he will take on Mensur Suljovic or Michael Smith in the quarter-finals on Sunday afternoon. The semi-finals and final will take place on Sunday evening.